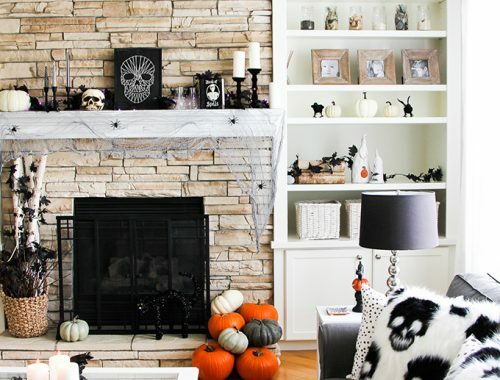 Here are some fun Halloween Decorating Ideas! Oh my Halloween is coming up on us SO fast, and the kids don’t even have costumes yet! Bad momma. 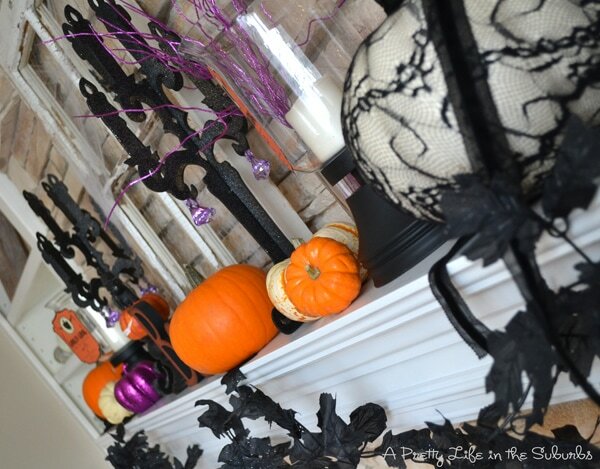 But the step is decorated and the mantel is done…that counts right?! I thought it might be fun to show you how things looked around here last year and the year before. We always have so much fun decorating and carving pumpkins! 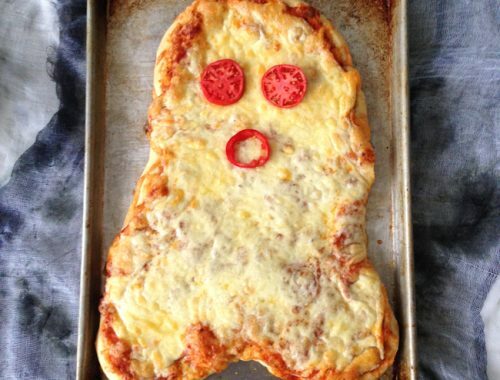 Maybe you will find some inspiration for your spooky day! 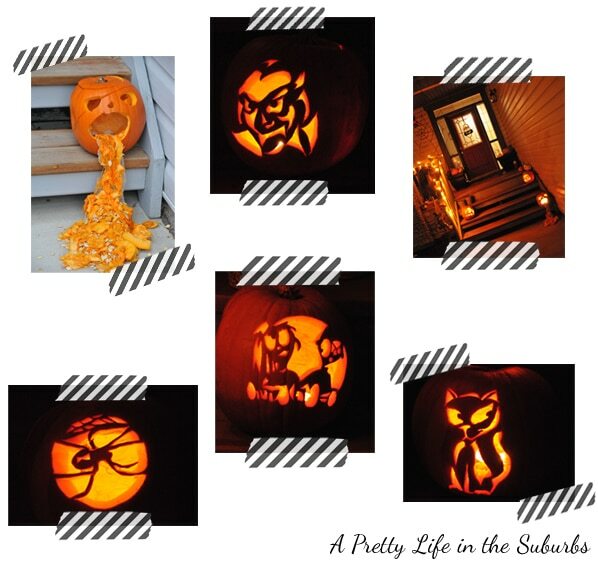 These are the pumpkins we carved a couple of years ago! So fun! Walmart has the best pumpkin carving kits, and I know that these look complicated, but really they were so easy to do! This is our step last year! Our *sick* pumpkin is always a big hit every year! Too funny! And you might notice my Spooky Eyeball Wreath. I still love this wreath! People found it quite spooky, so I say I made it just right then! This green gourd was my favourite last year! My Mom found these giant gourds at a market and gave them to me for my fall display. I took one look at it and knew it would make the perfect Halloween carving! Isn’t it so great?! 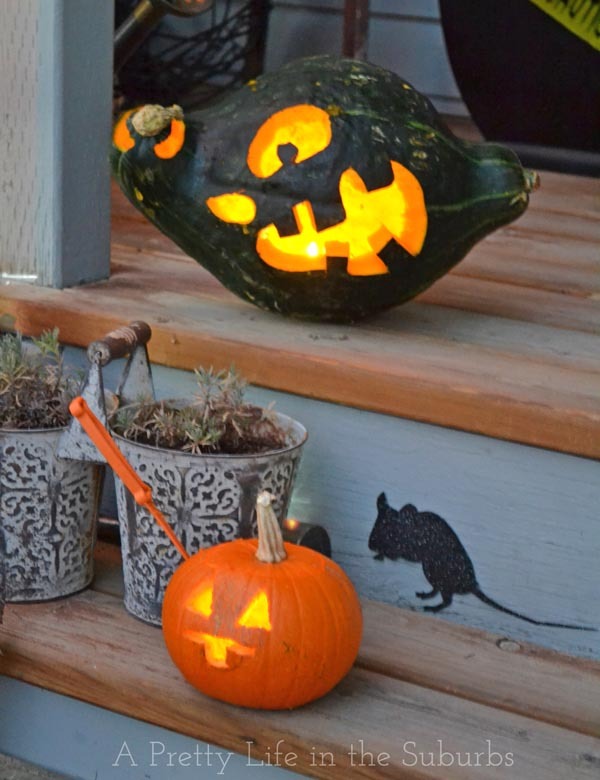 Carve those gourds! Here is my Halloween mantel from last year. I love the orange/purple/black/white colour combination so much that I did something very similar this year…stay tuned to see that! And a little vignette I put together. 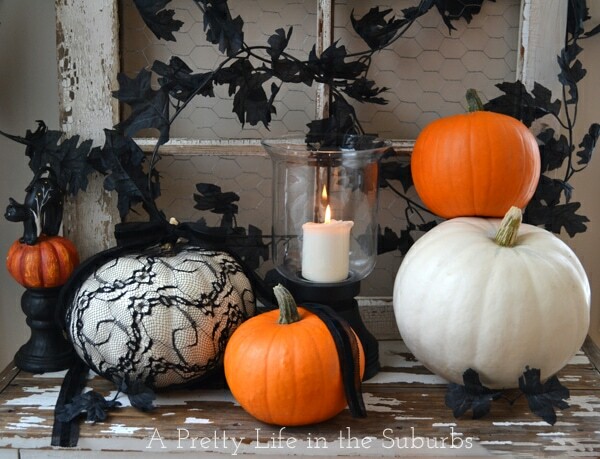 Love this lace pumpkin! Aren’t white pumpkins the best! 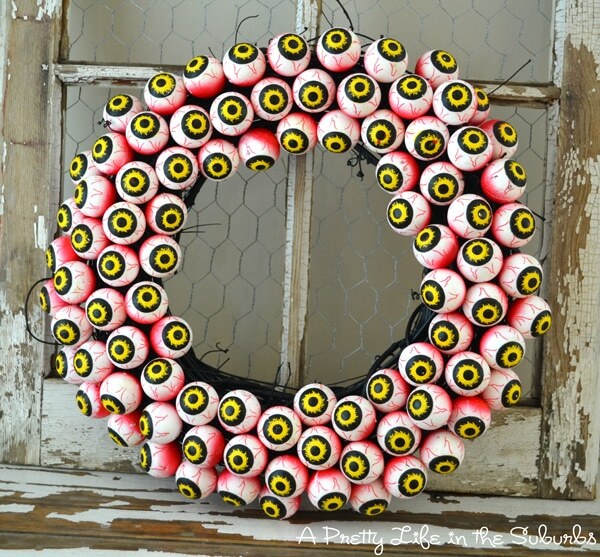 And my Eyeball wreath. Love it. Don’t need to say much else about it…pretty self explanatory, lol! 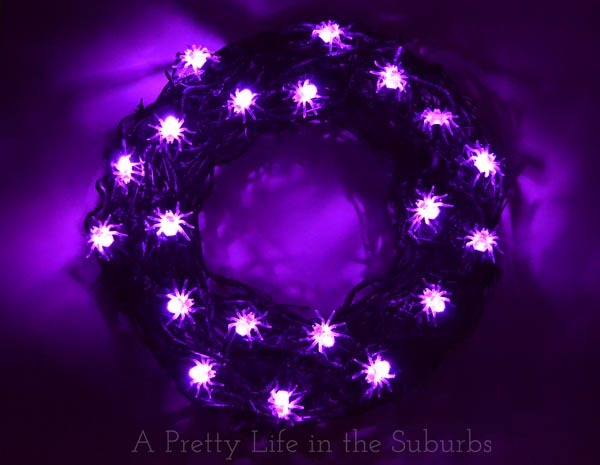 You might remember this Spider Light wreath that I made a couple of weeks ago! This looks so great on our front porch at night! 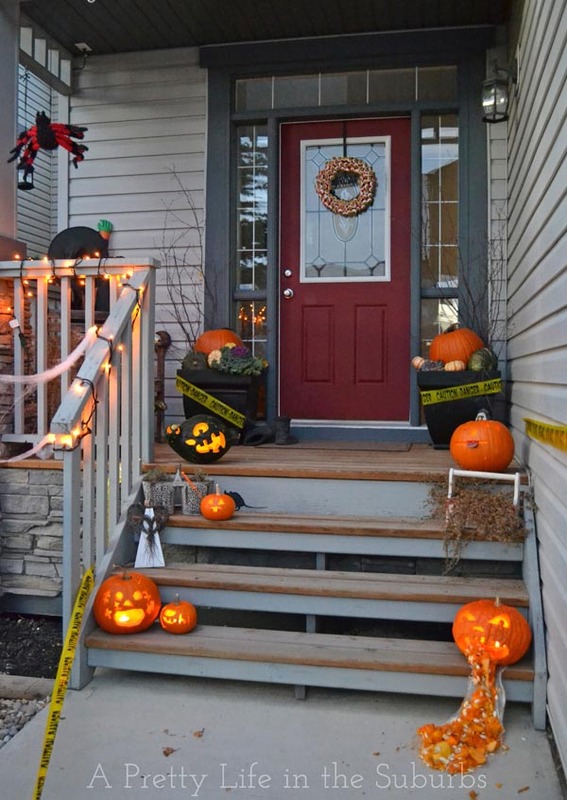 I hope you enjoyed this little Halloween round-up! I really love Halloween and we have so much fun with it every year! Can’t wait to show you what we’ve been up to this year, so stay tuned! 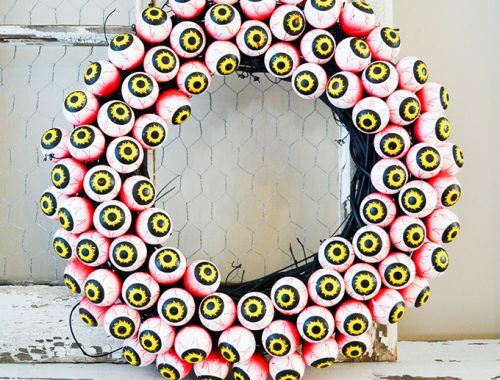 Love the eyeball wreath, very cool idea! BTW, that french toast dish looks soo good! Love everything you put together … much talent you do possess Jo-Anna. Send me a tiny bit please. love your ideas! especially the cat carved pumpkin! info in such an ideal manner of writing? I have a presentation next week, and I am on the look for such info. Attractive section of content. I simply stumbled upon your blog and in accession capital to assert that I acquire in fact enjoyed account your weblog posts. Any way I will be subscribing in your feeds and even I fulfillment you get entry to persistently rapidly.